17th July 2011 Amko Foods wins a coveted 3 Star Gold Great Taste Award for our Scottish Heather Honey. The Three Star Gold is the highest level and only awarded to 114 of the 7,482 submissions. Organised by The Guild of Fine Foods, the Great Taste Awards is the national benchmark food awards employing the country’s most rigorous judging system. Owner, Peter Martindale, said “we are absolutely delighted as it’s the first time we’ve entered the competition and to win a 3 Star Gold is unbelievable. It’s great news for our customers, we knew we were onto a winner when we first tasted it, and it’s great to know the judges loved the taste just as much as we do”. June 2012 Amko Foods launches Three more Vegetarian products. Amko Vegetarian Dumpling Mix – a new addition to the range – made with Amko Vegetable Suet (Palm Oil)- Ideal for Casseroles, Stews and Soups. A fantastic dumpling mix you will find very hard to beat. Amko Vegetarian Suet Crust Pastry Mix – Made with Amko Vegetable Suet (Palm Oil). Ideal for making Hot or Cold Crust Pastry for topping off casseroles. Give it a milk wash to brown the crust to a delicious golden crust pastryyou will find hard to beat. Amko Vegetarian Pastry Mix – Made with Amko Vegetable Suet (Palm Oil)- Ideal for making plain pastry for any homemade cheese & onion pie or potato/butter pies pie, or quiche. July 2012 Amko wins another Gold at this years Great Taste Awards for Old Fashioned Dumpling Mix. Organised by the Guild of Fine Foods, another record year of 8807 entrants were blind tasted and rigously judged by 350 independant experts. 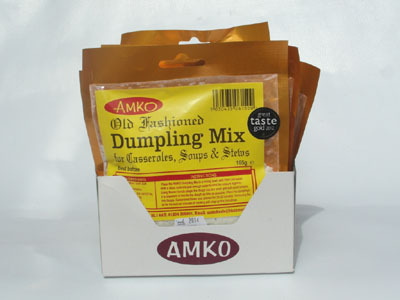 Owner Peter Martindale said ” this is great news for us and our customers, we knew our Amko Old Fashioned Dumpling Mix was very special, and it’s great to know the judges loved it as well.” Made with our very own Amko shredded beef suet, gives lovely light fluffy dumplings. Perfect for stews and casseroles.